After just reopening its caves to visitors, it has been announced that a bat at Iowa’s Maquoketa Caves State Park has tested positive for Geomyces destructans, the fungus that causes white-nose syndrome. During sampling of 15 of the bats hibernating at Dancehall Cave this past March, a swab from a big brown bat tested positive with a very low-level of the fungus. Despite the findings, the caves will stay open, albeit with the addition of “disinfection mats” to try to contain the fungus. 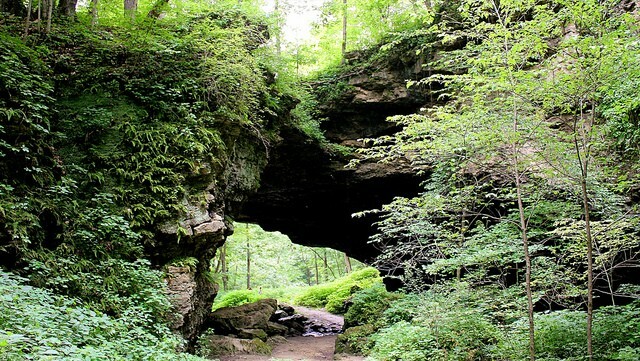 First closed in 2010 in an effort to protect the bats from white-nose syndrome, the caves were reopened in April after experiencing an 80% drop in visitors to the once popular park. Upon it’s reopening the Iowa Department of Natural Resources introduced a short educational program to teach visitors about the disease in hopes of preventing the spread of the fungus. Unfortunately seeing as these caves have had more than 10,000 visitors since their opening in April with education as the only defence, one would suspect that if people do transport the fungus, all the caves in the park would likely already be infected. Furthermore, considering that these caves are not exactly show caves and people explore and crawl around, the likelihood that the mats, which clean the bottoms of shoes, would be enough to properly disinfect people is not very good.